I can’t tell you how happy I am to be back in NC and how different it is to be living in a neighborhood vs. a high rise apartment building. Last week we had two sets of neighbors stop by to bring us dinner. Our neighbors across the street brought us a feast of Greek spaghetti dish, spanikopita, lemon broccoli, tomatoes in feta dressing, pita bread and homemade tzatziki. Our next door neighbors came calling with homemade vegetable soup and brownies. So wonderful! When I returned their dishes I wanted to bring them something as well and I thought, what better than my Grandma Sally’s pound cake? 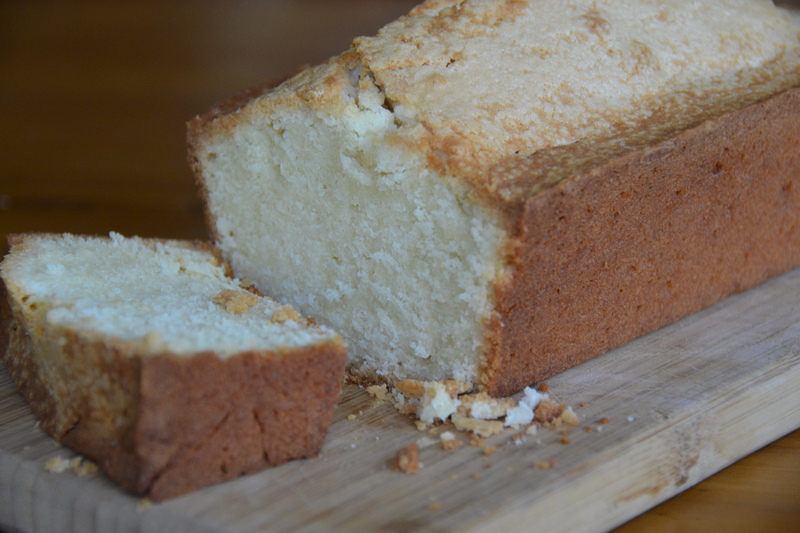 Pound cake gets it’s name from the traditional recipe that called for a pound each of flour, butter, eggs, and sugar. My recipe calls for a pound of butter (yes, that’s four sticks!) but scales back the other ingredients to make a rich, classic pound cake. I think the perfect pound cake is moist, buttery, with a hint of vanilla and almond, and with a golden flakey crust. You can make this in your 10 inch tube pan, bundt pan or as I did in two loaf pans, just grease and flour or spray whichever pan you use as this batter tends to stick in the pan if you don’t. This would be great served with strawberries and whipped cream, toasted for breakfast or served plain.